Head Coach Mark Haggett and his staff have been canvassing the Maritimes and the rest of Canada for top football recruits looking for the opportunity for a premier education and football experience in the heart of Halifax, Nova Scotia. 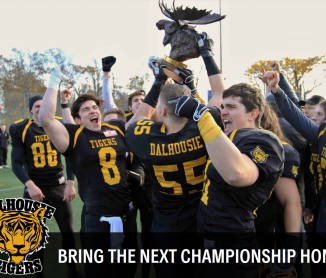 The Dalhousie Tigers Football program is proud to announce the largest recruiting class in team history for 2017, with many more names to announce before the 2017 season begins. While much of the 2017 class are local recruits, talented young men from across the country including Alberta and Ontario have committed to the Tigers for 2017. “We are very excited to announce the addition of these young men to the Tigers family,” said Coach Haggett. The Tigers coaching and executive staff is hard at work completing the 2017 class with a full class announcement coming in the near future. We will be profiling one recruit every Monday leading up to the 2017 season start. He was drawn to the Dalhousie program because of “the winning tradition in the AFL, and the high level of academics that come along with attending Dal.” Ian is a very mobile quarterback as shown in his highlight tape (VIDEO). His ability to throw on the run and trick defenses with designed quarterback runs will give the Tigers a speedy advantage in 2017. “I want teams to be afraid to face the Tigers on Saturday,” Ian added. “I would also like to be able to impact as many of my teammates performances as well.” We’re very excited to welcome the 2016 CPA Cheetahs team captain and honours student to the Tigers squad in 2017.